California citrus growers dodged a frozen bullet–twice–over the Christmas Day weekend. Forecasts of below-freezing temperatures on Friday and Saturday night in the San Joaquin Valley had area citrus growers worried about the prospect of a damaging hard freeze for crops, according to California Citrus Mutual, a local trade paper. The cold weather was part of a much-needed winter-weather system that included significant snowfall in the Sierra Nevada mountains and blanketed much of the state last weekend. Fortunately, with the cooperation of manageable weather and some unconventional temperature-control methods, Central Valley growers’ citrus crops emerged from the cold unscathed. Citrus Mutual reports that some growers ran water over grove grounds during the day, when temperatures remained above freezing, in preparation for colder nighttime temperatures. Some growers then switched on wind machines in the groves, with the wind blowing the warmer, moist air rising from the ground over the crops. 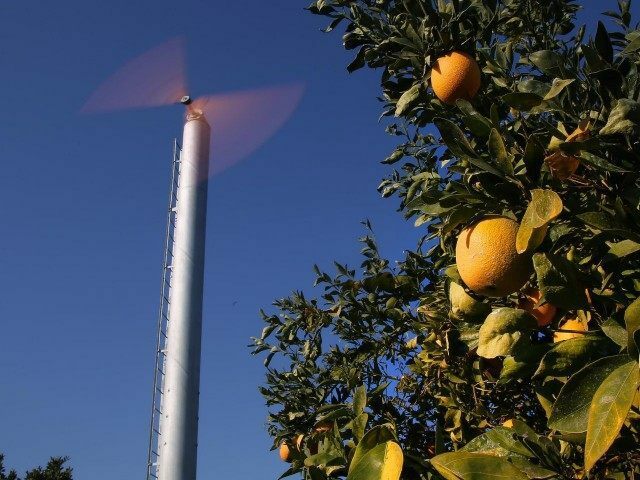 The outlet reports that the method could raise temperatures in citrus groves by three to five degrees, enough to stave off deleterious effects of excessive frost. The snowfall in the Sierras and other mountains has been welcome news to California as it enters a possible fifth year of record drought. The Sierra snowpack is at more than 100 percent of average for late December for the first time in years, as mountain ski resorts bask in the warmth of sold-out lift passes and lodge accommodations. Meanwhile, southern Californians are probably less excited about the cold air than growers and ski lodge owners. The Los Angeles Times reports that temperatures are expected to stay low throughout the week in L.A. County and surrounding areas, with overnight lows around 40 degrees. L.A. Weekly noted that Sunday’s low temperature of 36 degrees recorded at the University of Southern California’s weather station tied the all-time record low for the area set in 1916.